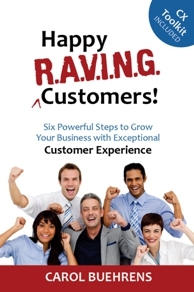 You want to improve your customer’s experiences? Great! Now, where should you begin? Well, before you get started, you may want to take a step back and assess what your customers are already experiencing today. Do you know every encounter your customers are having with your company, including what they read, hear, and see, through interfaces and correspondences? Your customers interact with your organization via a variety of different channels, including websites, event sites, microsites, landing pages, emails, applications, intranets, extranets, portals, blogs, marketing campaigns, online references, print materials, press releases, (take a deep breathe now because the list goes on), automated replies, customer support messages, videos, webinars, social media, storefronts, face-to-face, automated voice response systems, mobile apps, and more. Whew! Taking a good old “reality check” as your first step will help you establish what’s happening today and where you need to go tomorrow. This foundational groundwork will bring to light the good, the bad, and the ugly – great moments, interactions that need help, and outright gaps in your services. Collect a high-level internal view. Gather information from your internal teams, touchpoint owners and service stakeholders. Find out what they think the customer experience journey is comprised of. Put together an initial high-level map. Communicate this map to the involved teams, in order to reach a consensus and to establish the beginning of your project. Drill down to the details of each touchpoint. Ask front-line employees and (if you can) customers! Look for service gaps, inconsistencies, frustrations, and other red flags. 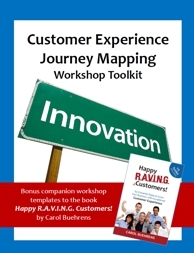 The Customer Experience Journey Mapping Workshop Toolkit ” templates are perfect for this. Host a journey workshop. Get everyone in the same room and show your touchpoint findings. Learn more — you’ll be amazed at what might surface. Break down the silos! Put the final “Current state” together. Use Customer Experience Journey Mapping Workshop Toolkit templates to detail each touchpoint and string them together to form the journey. Tape it on the wall for all to see and discuss. Remember, your customer’s experience isn’t about a single touchpoint – it’s about the journey. Now, innovate! Let everyone know that there are no boundaries — how would they improve customer’s experiences if they could wave a magic wand? How would they delight and surprise? Create a “new” journey. Using the same techniques as before, what might the journey look like in the future? You may need to bring in a touch of reality, but once you have this new vision, you can begin to figure how how to get there. Now – take action! Download your free E-Book “Customer Experience Journey Mapping Workshop Toolkit” to help jumpstart your Customer Experience Action Plans! In my new book, Happy R.A.V.I.N.G. Customers!, “Chapter 3. R = Reality Check” focuses on how you can use journey mapping to identify all of your customer’s touchpoints. In “Chapter 6. I = Innovate in Unexpected Ways” you’ll learn how to use journey mapping to go beyond your competition and create memorable experiences of differentiation.